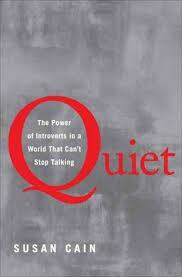 As I was going through the “Best of 2012” lists on various web-sites I noticed the book Quiet by Susan Cain came up quite often. So I got it – sounds like something I could get into. There’s lots and lots of information here, presented in a reasonably well organized fashion, well enough written, and it’s backed up with plenty of research. For the most part I was fascinated. I know I’m introverted, it’s never been a hang-up except when I tried to be comfortable around people for too long at a time. (LOL!) I like people around sometimes – mostly I prefer solitude and I certainly work on projects better by myself. Cain touches on lots of areas in which introverts are affected, childhood, personal relationships, work relationships, etc. In the area of childhood she makes quite a few suggestions and even though I’m well past childhood, caring for my own children, and even teaching young children (retired), I’m always interested in childhood education and development. The book was personally helpful in that I think I understand better how my mother and my daughter, both extroverts, need social activities. I need to take my mom to dinner more often – or just go over there for company. Overall, the book is basically a call for introverts to accept themselves as they are (in spite of their parents’ push for “popularity), for business to recognize and optimize the value of introverts in business, and for parents to pay attention to the individual needs of their children.